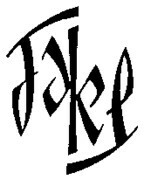 I just did a little Google search for information on ambigrams. I am still daily making them, trying to master this craft ( I will show some examples on this page), but I am also reading and writing about it. I have no idea what this will lead to. I have offered to write articles about this nano-topic for some magazines, but so far none were interested. 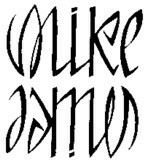 In my naivety I thought I was looking at an ambigram, so I tried to figure out how it was done. I even hoped that the music was ambigrammatic in some way too. But when I discovered that the texts on the screen are no ambigrams at all and realised that I had been reading the word hacker several times, it suddenly dawned upon me that I was looking at a hacked site. I have never seen this before, and maybe it is all a joke, but as far as I can understand the texts, this is far from funny. I am not in a position nor interested in giving my opinion on these matters, but it makes me sad to see aggressive and destructive behaviour, even if it are just data on my computer screen. I have no idea what can be done to make this world a pleasant place for everybody. I hate to say it, but I think that in essence the world is a pleasant place for everybody: most of the problems, if not all, are caused by ourselves. All that can be done is stop causing them. The whole idea of solving problems seems wrong to me; that is like trying to cure a disease by treating the symptoms. It seems that all I can do is not causing problems. That doesn’t make much change in a world that is shared by 6.000.000.000 people. And it doesn’t make me as happy as I want to be. Everybody has the freedom to express her/himself, but I just don’t like to be on a planet where so many people express fears and stupidity. And let there be no doubt about the fact that I am one of these people. Thank God there is music! As an antidote to all the fears, stupidity and aggression, there are ton loads of beautiful and inspiring songs. Like this esoteric masterpiece, Peace pipe , by the B.T. Express.